LOS ANGELES (AP) Dodgers reliever Ross Stripling was confident as the World Series headed back to California. ”If we can just hold them to less than 12 runs, we’ll get some wins,” he said playfully. Los Angeles players seemed dazed after Sunday night’s 13-12, 10-inning loss to the Astros, which gave Houston a 3-2 Series lead. Astros felt ecstatic and energized, Dodgers drained and dispirited after 5 hours, 17 minutes that resembled Rock `Em Sock `Em Robots transferred from a ring to a diamond. ”Baseball is a sport of momentum,” said Houston’s Brian McCann, who started the winning rally when he was hit by Kenley Jansen’s pitch with two outs in the 10th at Minute Maid Park. Los Angeles wasted leads of 4-0, 7-4 and 8-7. The Astros surged ahead 11-8 and 12-9 before the Dodgers tied the score in the ninth on Yasiel Puig’s two-run homer and Chris Taylor’s two-out single on a 2-2 pitch. Bouncing back from a rugged defeat in the Series can be difficult. Boston was twice within a strike of its first title since 1918 before losing Game 6 in 1986 by a 6-5 score when Mookie Wilson’s grounder went through the legs of first baseman Bill Buckner. The Red Sox wasted a three-run lead to the New York Mets in an 8-5 loss in the finale. Texas was twice within a strike of its first World Series title in Game 6 in 2011, but Neftali Feliz allowed David Freese’s tying triple in the ninth, Scott Feldman gave up Lance Berkman’s tying single in the 10th and Mark Lowe yielded Freese’s game-ending home run in the 11th. St. Louis overcame a two-run, first-inning deficit the next night to win 6-2. ”Sometimes when opportunity is in your presence, you certainly can’t let it get away because sometimes it takes a while before it comes back,” Texas manager Ron Washington said. Los Angeles landed back home at 4 a.m. PDT after Sunday night’s game, and the Astros traveled Monday. Neither team worked out. Justin Verlander starts for the Astros, tying to win the team’s first title in its 56 seasons. In a rematch of Game 2 starters who did not get a decision, Rich Hill opens for the Dodgers. Forty-three of the 65 teams with 3-2 Series leads have won the title, including 25 in Game 6. Home teams have won four of the last five Game 6s and 15 of 20. Last year, Cleveland took a 3-1 lead in the Series, lost Game 5 at Wrigley Field, and failed to win either Game 6 or 7 at home. Astros manager A.J. Hinch thought back to this year’s AL Championship Series, when the home team won every game. ”Most of the time you ask your team to have a short memory in good and bad. In this particular situation I want our guys to remember exactly how we felt coming home after the Yankees, getting swept with the Yankees and having a 3-2 deficit. 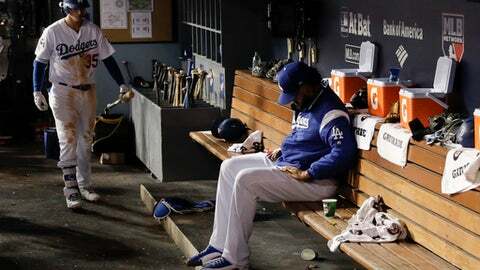 We weren’t going to give up and the Dodgers aren’t going to give up, either,” he said. ”So we have to go no further back than the last series that we need remember that anything is possible, and the team that is down is going to come out just as hungry as the team that’s ahead,” he said.